Flavor Text: I know too much. If anything happens to me, check locker 202 at the bus station. If I'm reading this right, the story card's effects still resolve, after the card goes back into the story deck right. This would mean you use his ability to sacrifice one of your own story cards for the sake of enacting it's effect? Correct. It would be an awful ability if the story effect never resolved. You would never trigger it. It's not often you'd use the ability as it is unless your strategy is decking your opponent. Story effects have generally gotten weaker with time and as such, this card has become increasingly unplayable. Track8, what do you mean "decking" your opponent? I'm pretty new to the game. 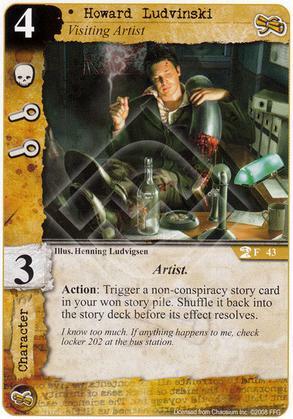 Even looking at the original story cards, nothing really jumps out at me as a really great combo with this guy. Decking means depleting your opponent's deck to the point that he loses the game. If that's your main strategy, then you don't really care about trading in your won story cards for big effects. You're not planning to win by the conventional "3 story" strategy anyway. Decking your opponent isn't usually the preferred strategy though, so in most cases I agree that Howard's ability seems cost-prohibitive. Welcome to Call of Cthulhu, by the way! As a matter of rules, If at any point a player has no cards remaining in their deck, they are immediately eliminated from the game. (see draw phase description). This is a somewhat uncommon victory method but does prevent games ending in a stalemate of some kind. And some proportion of decks/strategies actively attempt to make the opponent lose this way, rather than winning by the various other ways. This strategy is also called 'milling' by some people, especially with a MtG background.